Goodyear softshell Fast Wheel, designed for demanding outdoor activities, providing a good level of protection and climate comfort while looking great. The lightweight Clime® membrane material is breathable with windproof and water-repellent features, disperses moisture and regulates body climate. 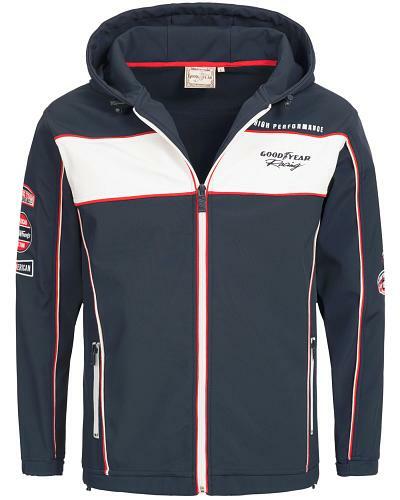 Fast Wheel is not only an outdoor garment, the racing theme styling allows you to wear this eyecatching and cool jacket anywhere and anytime you like. 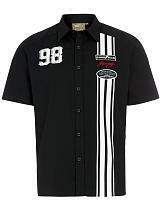 All logo's are either directly embroidered onto the jacket or embroidered on a badge. A must-have for all Goodyear fans. 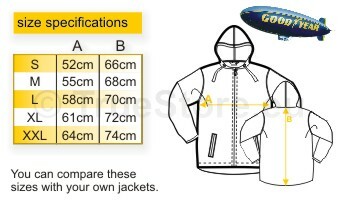 fixed hood with elastic drawstring with fastners for fast adjustment. Pefect sizing, fits in hat, cap of sports helmet. Available in navy blue, in sizes S till XXXL.